Costa Rica has an astonishing number of plants, and people are drawn from all over the world to see the beautiful flowers that grow here. 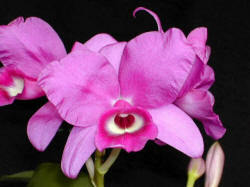 Of special interest to many are the numerous varieties of orchids. In fact, Costa Rica has over Thirteen Hundred species of orchids. Below, (thanks to contributor Paul Mitchell), is some more information on these marvelous plants! If you are an orchid fancier in the States or elsewhere than the tropics you are in for a fabulous treat once you get to Costa Rica. In Costa Rica there are various options for seeing / studying orchids. Those that come to mind are, in nature, in botanical gardens, and in the regional orchid shows, specifically at the National Orchid Exposition. The best time of the year for orchids in Costa Rica in the wild is just as the rainy season is starting up with the first scant rains. 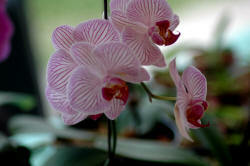 Many of the orchids in nature are triggered into their blooming cycle at that time. 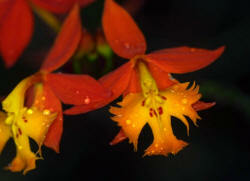 There are more than 1300 recognized species of orchids in Costa Rica. Some are small, some large, many are quite showy. Many have amazing scents or perfumes, along with a few that smell truly unpleasant. Bring your nose along. You will be intrigued at the variety of odors the various orchid species can emit. You may be able to arrange a knowledgeable guide to take you into natural habitats to see some of the native orchid species in bloom. Costa Rica’s strong conservation laws and efforts at replenishing native orchid species in the wild preclude taking any orchids from the wild –except by making photo records of them in situ to carry away with you inside your camera. You can also visit one of the amazing botanical gardens in the country like Lankester Botanical Gardens just east of the old capital, Cartago. Or the Wilson Botanical Gardens in the south east part of the country near San Vito de Java. Each one is worth a day trip and requires three or more hours to explore properly. The National Orchid Exposition is admittedly the crown jewel of orchid shows in Costa Rica. Presented in March of each year in San José, it brings together blooming orchids from the best growers all over the country. It is a riot of colors, extraordinary shapes, and exotic perfumes. It is at this show you can see many varieties of the national orchid (mentioned above) ranging in color from whites thru pinks to that glorious intense lavender-purple colored form. There is a competition for the best of each color form and for the best overall in the show. There are always some remarkably handsome specimens of this much revered species on display in this big show. If you cannot be in Costa Rica for the National Orchid Exposition, there are smaller regional shows staged in different parts of the country. There is about one show per month and if you watch the newspapers there will be an announcement of where a particular show is taking place. In any event, bring along your camera and plan on taking lots of pictures. Orchids make fine photographic subjects. If you are really lucky you may get an invitation to visit a private orchid collection. There are a number of stupendous collections of orchids held privately. A visit to one of these collections is not to be missed, so if you are invited to see one don’t pass it up. If you are interested in attending the National Orchid Exposition or to learn more about the orchids of Costa Rica, contact the Asociación Costarricense de Orquídeas in San José. Their website is http://www.ticorquideas.com and their email address is info@ticorquideas.com and they meet on the third Monday of the month.